A newlywed was trying to impress her husband with a meal her mother had cooked. She took a ham, cut the end off, and put the large part in a roaster for the oven. Her husband asked her why she cut one end off. She replied, “That was how Mom did it.” Now curious, the young woman asked her mother why she cut the end of the ham off before cooking. Her mother replied, “That was how my mom did it.” So the both of them went to Grandma to ask about the ritual. She replied, “At the time that was what would fit in the small pot I owned.” Sometimes when you see or hear something long enough it becomes an unquestioned path. When you come in contact with a virus, you may or may not become sick depending on your current state of health. You can create immunity to that particular virus. Immunity is a complex individual phenomenon that can last for years. 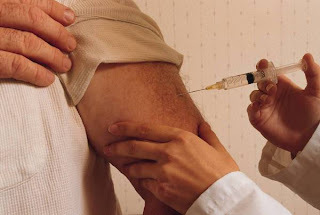 Vaccination is an attempt to create an immune response in the individual as a prevention of the disease such as influenza. The flu virus is not a stable virus. When it infects a person, it uses the cells of the person to replicate or make more viral material. Your body will develop immunity to that particular virus. But viruses are ever changing and can even change from one person to another during the flu season. There are hundreds of possibilities. You can get the flu shot and get flu like symptoms from that shot and/or still get the flu later. If we have a naturally mild flu season then you can claim vaccine effectiveness. If we have a heavy flu season the news will report there was a “mismatch” of the flu vaccine. Flu vaccination manufacturers by law bear no liability for any harm done by their products. We have all heard that the flu kills 36,000 people per year. Of course this number never changes in the media which is evidence of our corporate training. The American Lung Association, “ Trends in Pneumonia and Influenza Morbidity and Mortality April 2010, page 13, reports influenza statistics from 1979 to 2006. The total deaths for 2006 were 849. Perhaps they are adding in pneumonia deaths but it is still inaccurate. You could also look at the details of influenza deaths by age group, page 20, to see that infants and children do not have a great risk. The 65 years old and up has the highest risk. Consider the following information taken from the pharmaceutical manufacturers package insert. This link has detailed information from manufacturers about influenza vaccinations and others. Each year, scientist guess which flu virus may occur months ahead of the beginning of the flu season. They select 3 to 4 viruses to be manufactured into the new flu vaccination. These are viruses from 2008, 2009, 2010, and 2011 depending on the product. Were we not here living and breathing those viruses of the past? Theoretically this means we could already have that immunity to the viruses of the vaccination. If the concept of flu vaccination actually worked why would we need a booster every year? Many of these vaccinations still contain thimerosal (a known neurotoxin that contains mercury) as a preservative. There are some preservative free products. Other ingredients may include egg protein, hydrocortisone, antibiotics (neomycin, polymyxin B, kanamycin), formaldehyde, detergents, and polysorbate 80. We are knowingly injecting toxic drugs and chemicals into your body. The most troubling “side effects” relate to the nervous system and include Guillain-Barre’ syndrome that translates into hospitalized paralysis and either years of recovery or death. Headache, syncope shortly after vaccination, dizziness, neuralgia, paraesthesia, convulsion, myelitis (including encephalomyelitis and transverse myelitis), neuropathy (including neuritis and brachial plexus neuropathy), paralysis (including Bell’s Palsy and other cranial nerve paralyses), Guillain-Barré Syndrome (taken from a package insert). The argument that the vaccination of children to minimize transmission to other family members is invalid because of weak methods used in the primary studies. Little comparative evidence exists on the safety of these vaccines with no long term safety information. The Lancet reported that “The effect of influenza vaccination on the risk of pneumonia in elderly people during influenza seasons might be less than previously estimated." Statistics cannot account for the impact to an individual or family that suffers from any disease or treatment of disease. I am very concerned about the injection of toxic material that causes neurological damage. There are no long-term studies that measure such effects in children or older adults. We already have too much neurological disease including Autism, Attention Deficit, and Alzheimer’s. This blog is written for general informational purposes only. This information should not be used for the diagnosis, recommendation for treatment, nor should it be considered a replacement for consultation with a healthcare professional. If you have questions or concerns about your health, please contact your healthcare provider.